There was a user stating problems about the quality of the seams and padding. Are you wanting to go to the beach and yet, would like to take your recliner along? If it is your usual recliner, there is no way it is possible. But, if it is the LafumaFutura XL Air Comfort- Zero Gravity recliner, then pack it up and take it along with you. 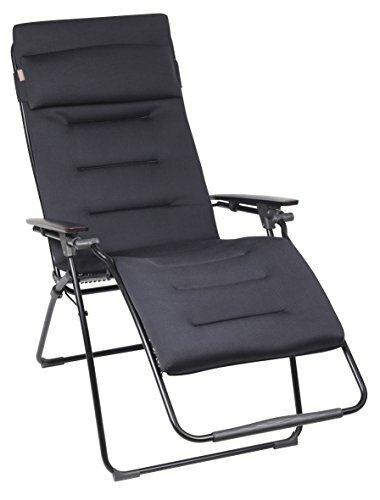 This is a smart, foldable, and easy to carry recliner comes with a durable black steel frame that gives the chair the strength it needs to accommodate any person in the most comfortable of positions – inside, on the patio and even at the beach. People invest in recliners just to give their body the comfort it needs, and to ensure that their back, shoulders, arms, and legs get the support it deserves after a day of hard work. LafumaFutura XL Air Comfort – zero gravity recliner has an ergonomic steel frame that one can fold and is portable enough to be thrown into the car. The chair has 20mm (of High Limit Elastic) steel tube frame that gives you firm support. This recliner comes with ‘Acier Air Comfort’, a fabric that is anti-rot, anti-mildew, and anti-fade. It’s been reported any times that this recliner won’t fade after multiple washes or many summers outside. It is a must-buy for those who require supreme support for their body outdoors.